The UI team's goal is to continuously improve the user interface, with a focus on workflow simplicity of use for artists. To keep it all manageable and to avoid people sinking time into discussions that do not lead to actual implementation in Blender, we will follow a strict process. The Workboard (on the left in the menu) contains the tasks that have been proposed or are being worked on. In these design tasks developers and UI designers can do focused design work and approve a final version, after which a developer can choose to implement it. These design tasks should only be created by developers that will implement a change, and by the core UI team members listed below. Everyone is invited to participate in the discussion of existing design tasks, propose solutions and of course implement them. There is a small number of guidelines that any UI design in Blender should follow. More should be added in future. Catalin (giakaama) added a comment to T54963: Industry Compatible Keymap. William Reynish (billreynish) added a comment to T54963: Industry Compatible Keymap. To me 1-2-3-4 for vert-edge-face-object wouldn't be the worst thing, but it is odd to put object mode in the middle between edit and paint modes. I guess it would be mainly to help those familiar with 3ds Max, or am I missing someplace where this convention exists and is considered to work well? -L0Lock- added a comment to T56648: Blender 2.8: Naming Conventions. What about "Link" and "Append" ? Dan Pool (dpdp) added a comment to T54963: Industry Compatible Keymap. I found a great way to have the keybindings w, e, and r trigger the active tools (I won't restate my opinion of why this is bad if you're trying to attract users of other software) as well as the traditional blender way of doing transforms. Set move to W with a Click Drag value. This way tapping the W key activates the tool (this should really just toggle the gizmo imo) and moving the mouse while the w key is pressed goes directly into moving the object. I think a lot of new users will like this behavior since it's so much faster than working with gizmos, but will likely not stumble on it with the industry compatible keymap as-is. Juan Hernandez (ArmoredWolf) added a comment to T54963: Industry Compatible Keymap. As an outsider user (I love learning new software, Maya, Modo, Max) I agree that Blender’s mode switching implementation worked fine and was already very similar to the standard so maybe we should just keep it. Campbell Barton (campbellbarton) updated the task description for T55194: Shortcut Keys Changed in 2.8x. Dan Silverman (ArgentArts) added a comment to T54963: Industry Compatible Keymap. @Dan Silverman (ArgentArts), note we are talking about the Industry Compatible Keymap here, which is not the default Blender keymap. We have no plans to change mode switching in the default keymap. Brecht Van Lommel (brecht) added a comment to T54963: Industry Compatible Keymap. Do you consider such users a target audience for this keymap @William Reynish (billreynish) or is it only focussed on making the transition easier for non-blender artists who want to switch application coming from MAX/Maya/C4D and so on? Maybe we should first get the target audience straight before discussing any further. 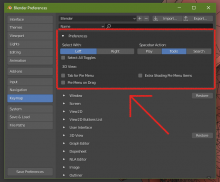 Using 1 for object mode is used by some other apps, and it’s also the default mode in Blender. Plus, it mirrors the same order you see in the Mode drop down menu. So I’ll keep it this way. Escape is used to cancel running jobs (like shader compilation, render, baking), using that for object mode switching would conflict. Particle mode will disappear, so I wouldn't worry about inconsistency there too much. Hair will become an object type with an edit mode and then it becomes consistent. The selection modes thing is tricky because we want to match the industry standard, but then also the opinion seems to be that none of the main apps actually get it right? Maya and C4D don't use number keys. Modo in latest versions does not use it either as far as I can tell from the docs? 3ds Max uses 123 but the way it switches to object mode with toggling is considered bad? Houdini is the one that makes sense logically and ergonomically but is not considered standard enough. Ludvik Koutny (rawalanche) added a comment to T54963: Industry Compatible Keymap. Yep, another vote for the Tab key for object mode toggle. If quick search is an issue, then that one is equally as much found on Ctrl+Space or F1 keys in other apps. Mitch (Mitch) added a comment to T54963: Industry Compatible Keymap. Yeah, I think Blender's default keys (Tab to enter/exit edit mode) are the best choice here. From my experience, most packages don't really use a quick search like Blender, so it seems logical to me to have something as commonly used as edit mode on a nicely accessible key like Tab. That cannot work in practice. Then there would be no way to switch to Edit Mode if you are inside Particle mode. The whole idea with using the number row for modes is that you can switch immediately and directly to whichever mode you wish. So the keys must keep working. Also, it doesn't appear to be working in other modes with multiple sub-modes. Such as hair edit mode. Hair edit mode has 3 submodes yet 234 buttons do not switch them but instead switch back to mesh edit mode. I would gladly use the order or vert, edge, face, object, but it creates problems with objects other than meshes. That is the main reason. Eric Majka (Dheim) added a comment to T54963: Industry Compatible Keymap. I would rather not use Esc, which is both odd and hard to reach. Will keep as-is because none of the other alternative proposals will work well. Agreed that Esc is not really all that ergonomic. I'd definitely prefer it to not be Esc. Tab is more useful for other things like operator search. Maybe this is true in other modes but the number of times I need to search for an operator versus going in and out of Object/Edit mode isn't even a comparison. Perhaps other people model by using the search feature but I think I've used it twice since 2.80 came out, while going in and out of Edit mode is something I do hundreds of times a day. Literally. Having fast access to the search feature versus easily going in and out of Edit mode is a no-brainer to me. 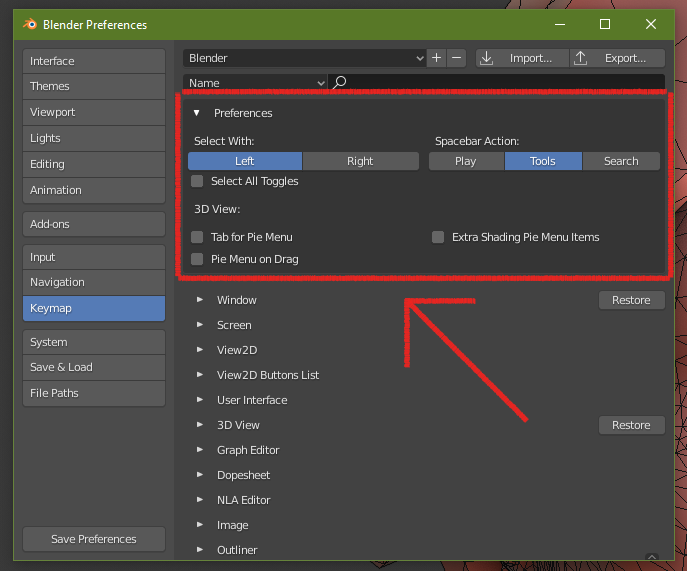 I thought the purpose was not to be the way Blender is by default but instead to mimic what other apps do? I was part of the discussion earlier in this thread with regards to 1/2/3/4 for Edit mode and I think the argument was made that only one other app uses 1 as an Object mode and it was Houdini or something (which is hardly known for having a robust modeling toolset). I know of no other app that use Esc for object mode. 1 is used by some apps and it works well for Blender’s various object types. @Ludvik Koutny (rawalanche) Which key for object mode? Tilde is not a good option because it doesn't exist on many keyboards. 4 has the issue I mentioned many times already, which is that for non-mesh objects, there is no vert/edge/face mode, creating a gap in the keymap. I created an addon and a keymap to make the QWER keys work in a more industry standard way. I created a script and a keymap to make the QWER keys work in a more industry standard way. Chris Yearn (yrrnn) added a comment to T54963: Industry Compatible Keymap. +1 for keeping TAB as object/edit mode toggle, and 1, 2, 3 for vert, edge, face mode etc, as it currently works in the Blender 2.80 default. I think that works quite nicely, and is more "industry compatible" than the current implementation in this keymap. We can find another key for Operator Search. Oskar (Oskar) added a comment to T54963: Industry Compatible Keymap. It creates a point every time you hover over an edge (without clicking). But it works fine with my settings, don't know why. If you like I can try to reproduce how I set it up. Nebez Kassem (nabaxo) added a comment to T54963: Industry Compatible Keymap. Regarding the key for the operator search, I have been playing with the idea today that it could be put on CTRL + SHIFT + P as is often done in Code Editors (like Atom or VS Code) for the command palette. One downside is that this is a more cumbersome shortcut than simply TAB. On the other hand I've been using CTRL + SHIFT + P everyday at work for quite some time now and don't mind it anymore. This would be an amazing choice for us used to coding. @Nebez Kassem (nabaxo) Of course switching modes is important. It's essential. That's why we use the number row with the most used modes furthest to the left on the keyboard. @Michael Klement (zaha) It could work but is also non-standard and then leaves no good place for the operator search. The current behavior matches Houdini more and happens to work well with Blender's various object types and modes. Honestly, the operator search is a great thing to have, but it's not nearly as useful as being able to toggle between edit mode and whatever other mode you're currently in considering Blender's workflow. At least give us the option to bind the toggle somewhere and deal with the conflicts ourselves. I wouldn't mind moving the search to somewhere else of my liking. William Reynish (billreynish) updated the task description for T54963: Industry Compatible Keymap. @Nebez Kassem (nabaxo) For the reason I already said. We can add options here, but a keymap is like one of those games of small squares. If you move one item, then it conflicts with another item, so then you have to move that, and so on it goes. Adding options for alternatives gets very messy, so initially I would like to avoid it, and keep this keymap lightweight and maintainable. @Dan Silverman (ArgentArts) Blender's default keymap does not use the number keys for mode switching, so that's why it's different. Yes we could use the order of 1 vert, 2 edge, 3face, 4 object, but in practice it doesn't work for curves and other object types. This might sound dumb, but why can't we have a preferences panel like in the regular keymap where, amongst some other settings, we can switch between tab as toggle and the 1-8 system we have? @Juan Hernandez (ArmoredWolf) The loop select extend issue was simply a bug in the keymap. It is now fixed. select more than one edge loop it's almost impossible, for vertex it's ok but for edge and polygons doesn't work properly. To select more than one edge loop, you have to hold down SHIFT and then single-click to select ONE edge in the next loop you want. Then, still holding SHIFT, you double-click on the single edge you'd just selected and you should then get your new edge loop added to your selection. It took me awhile to figure out this is what needed to be done. I don't think it's ideal, but it does work. This works with polygonal faces, too.